After the Space race during the cold war, NASA is once again embarking on a seemingly impossible task of putting men on Mars. It is collaborating with several companies in the private sector to make this happen. One such private company which stands out is SpaceX. SpaceX is fervently working on the transport system to take travelers to the Martian surface. This however is not the only thing to be done as the travelers will need supply of oxygen and food during their time on the red planet. Researchers all over the world are working on several support systems that will potentially help the Mars travelers sustain without too much dependence on the earth. 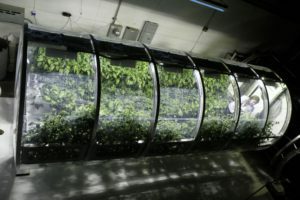 Apart from structures built for the astronauts, it will also be feasible for them to have access to their own food which can be grown in greenhouses. This is where the University of Arizona’s Controlled Environment Agriculture Centre comes in. They have been working on inflatable greenhouses for use in space. They haven’t been developed especially for Mars but for future space travel requirements. The University is working along with Mars to develop a closed loop system. A closed loop system would mean independent function of the greenhouse with limited dependence from other systems. 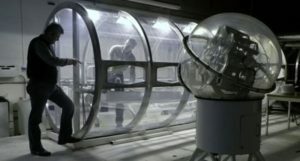 This inflatable greenhouse will be set to provide astronauts with oxygen, clean the air of carbon dioxide and provide the food requirements of the astronauts. This Inflatable Greenhouse is a bio-regenerative life support system and looks to create a miniature earth like environment using plants and LED’s. The Greenhouse itself is an 18 foot long, 7 foot wide cylinder. The system will recycle the carbon dioxide exhaled by the astronauts to be used by the plants in the greenhouse. The plants will then convert the carbon dioxide into oxygen for use by the astronauts. Water will be introduced into the system and recycle itself so that extra water will not be required. Water can either be from supplies sent from earth or from water found on the planet’s surface. The University of Arizona is working on a prototype that can soon be tested. Owing to concerns about space radiation, the greenhouse may be buried underground which is why LED’s may be required. However in some cases where sunlight itself will be adequate, it will not be buried underground. The University of Arizona is working along with NASA’s Kennedy Advanced Life Support Research to decide which plants and seed types to send along the trip to Mars which will be most useful to the astronauts not only in terms of providing a food source but also in recycling the air. Scientists have previously grown several types of plants and flowers in space on the International Space Station. This has shown scientists how to grow plants in space and on other planets. 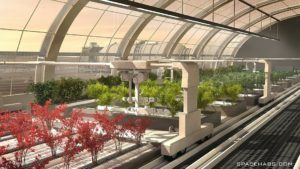 Since a space station is not a very stable option for a food source, it is up to these greenhouses to help the astronauts. After all, if astronauts are self dependent on Mars, it reduces the cost of having to send supplies frequently from Earth.